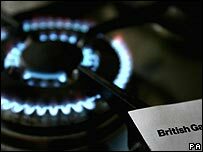 British Gas has seen complaints from customers more than double since last year, according to Energywatch. From October 2006 to March 2007, the firm had 21,427 complaints, most of which were from customers disputing their bills, the watchdog body said. The firm's share of the electricity and gas market is 30%, but it gained more than 70% of the industry's complaints. British Gas admitted that it was having problems with a new computerised billing system. I have given the British Gas billing department our meter readings at least eight times and their system still fails to send me a correct bill. On the day I received a letter from customer services saying this was being looked into, someone turned up at our house to turn off our gas! Energywatch said that the total number of complaints and enquiries from British Gas customers hit a record 14,001 last month. "It had a problem when it migrated a lot of customers' accounts from one database to another, and that's going to cause a problem for any company," Energywatch's campaigns director Adam Scorer told the BBC. "But it has compounded the error by not having the level of customer service, and the ability to handle customer complaints, in a way that leaves customers assured that British Gas is taking their problem seriously." British Gas said it had taken on 800 extra staff to deal with customer queries, but admitted the firm's performance was "not in a place where we want it to be" and that it "very much regretted" that customers had suffered bad experiences. "Obviously we apologise for the inconvenience and the stress," managing director Phil Bentley told the BBC. "I understand what it's like to get a bill that's incorrect. We apologise to those customers and we're working very hard to improve services." The company added it had installed a new billing system, which it claimed would "greatly improve service". The majority of complaints over the six-month period - 15,456 - were about billing, said Energywatch, on subjects including incorrect meter readings and out-of-date account details. While British Gas complaints have more than doubled, most other suppliers have at least halved their complaints on a year-by-year basis. Customers complained about delays in issuing refunds, failure to amend account details even when they had already told the firm, and money being taken from their accounts even after transferring to another supplier, according to data from Energywatch. The firm with the next highest number of complaints, NPower, had 2,535 complaints or 9% of the total, followed by Scottish Power with 6% and Powergen with 5%. Meanwhile EDF had 4% of complaints, while Scottish and Southern Energy had 1% of complaints. Is it worth switching energy suppliers?